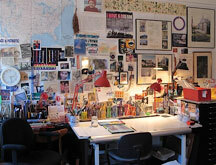 The roots of my art practice are in design, color work, drawing, and printmaking. I am always observing the natural world and built environment and collecting images, colors, and patterns for my studio work. My watercolor paintings are built slowly on fine ARCHES rag papers. The process is meticulous, and most paintings contain layers of transparent watercolor pigments, translucent gouaches, and opaque color-pencil and ink marks. I work on a layer , let it dry thinned another layer. I enjoy the discipline of careful process and the delightful colors and compositions that occur in the layering of images and materials. Because the perimeter of most paintings is masked, they appear to be prints, but they are unique one-of- a -kind paintings. Most watercolors are matted and framed with glass. I have also worked to present some of my watercolors on wooden panels, instead of the traditional use of of matte, glass and frame. This approach helps to keep the cost of the work down, as the traditional matte , glass and frame is quite expensive. I take a completed watercolor painting- done on the same ARCHES rag paper- and attached it to a 10” x 10” or a 12” x 12” CLAYBORD panel using GOLDEN’s liquid gel medium. 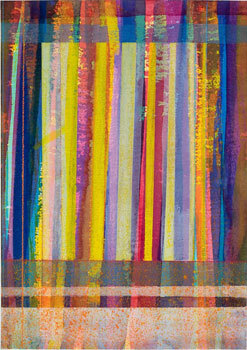 The attached painting is then sealed with a GOLDEN’s Archival UV resistant varnish. I apply two coats of gloss varnish and finish with one coat of matte varnish. The finished work is the full size of the panel, and is well protected. The panel’s wooden sides have been painted with a latex paint in the color of the Arches paper. The panel can be re-painted in any color, and in some cases, a frame may be added. I am a member of Peregrine Press , a wonderful printmaking collective in Portland. I do most of my printing work on the large and small Peregrine studio presses there. We have been focusing on adjusting the printing processes and materials so that they are less toxic. One monotype in this exhibit, “BUTTRESS”, was made for the Peregrine Press’ 25th Anniversary Show at the Portland Public Library’s Lewis Gallery in May and June 2016. 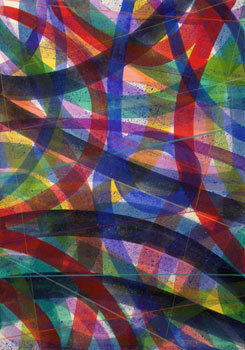 I have been working on a series of colorful monotypes, using water based AKUA inks on ARCHES RIVES printmaking papers. 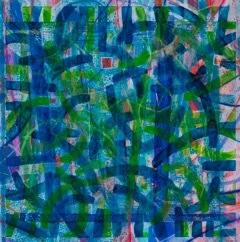 The monotypes presented here are made working directly on large plexiglass or pet-g plastic plates with the water based inks and a broad mix of tools, including rollers and brushes and, sometimes, adding watercolor crayon marks directly onto the plate. The plate is then run through the press, making one distinct print. Occasionally, I print the same plate a second time to produce a lighter value “ghost” print. Sometimes the plates themselves are built up with glues and other added materials to be collagraphs, or incised, to be intaglio prints. Both of these approaches can form the base plate for my monotype prints. The many printmaking processes and techniques are endlessly fascinating. I would be delighted at any time to share more information about this area of my art practice. For some of these monotypes,I have returned to the dry print and added watercolors, inks, gouaches , color pencils or collaged materials. These additional materials are always noted. 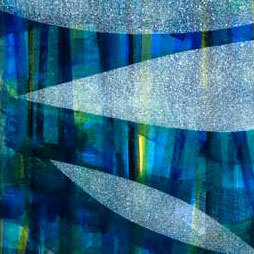 As with my watercolor paintings, I like the layering of colors and images which occur in this approach. For this exhibit, I have loosely framed some of the larger monotypes without mattes. 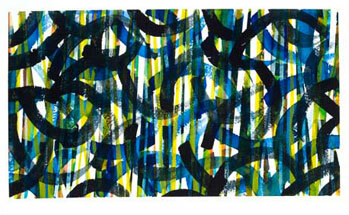 I have put up other large monotype prints with magnets. Because the cost of framing is so high, I am glad to offer ANY of the 22” x 15” monotypes- unframed- for half of the cost of the framed prints. In June of 2016 I was a fortunate to be part of a printmaking workshop led by the well-known Somerville MA printmaker, Catherine Kernan, at the Ballinglen Arts Foundation in Ballycastle, County Mayo, Ireland. 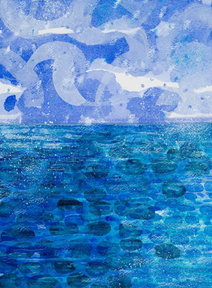 I worked on a series of small monotypes with AKUA inks and Japanese KITICATA papers. We experimented with varying the viscosity of the inks to make many layers of images and colors on one plate. 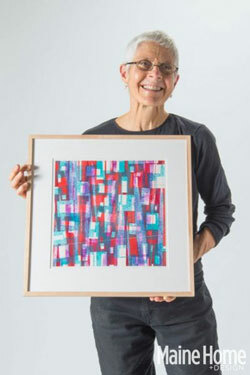 The smaller prints, framed in walnut, which are a part of this RED THREAD exhibit, are products of those explorations . They represent the new challenge of working on smaller plates, and with more subtle colors! Romare Bearden, Richard Diebenkorn, Kathe Kollwitz, Alvar Aalto, Carlo Scarpa, Albert Bigelow, Lois Dodd, Saul Steinberg, David Hockney, Michael Mazur, David Bumbeck, Mary Cassatt, Jon Imber, and Marion Plack, for starters…plus assorted greats like Whistler, Sargent, Homer, Hoffman, Matisse.They, and others, inspire me! 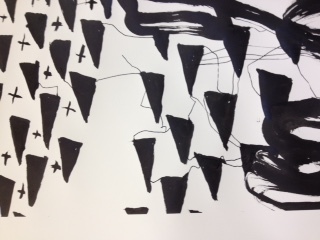 Drawings can be made by any mark making tool, and be connected to the world around or to the world within. The materials can be very simple. A friend of mine who once worked in Aalto’s Helsinki office told me that they taught and required him to make all line weights in their drawings using just one thick and soft lead pencil. I taught observational drawing when I was an architectural grad student. One of my favorite teaching tools was Bernard Chaet’s excellent book, The Art of Drawing, which is basically a road map through his years of drawing classes at Yale University. While I understand the many benefits of making and sending computer drawings, I still sketch, lay out, and draw all of my design drawings by hand. For me, there is a direct and important hand to memory connection in my brain. I appreciate the knowledge which comes from looking intently. Few architecture schools teach freehand drawing. I have read that some well established architects, like Nova Scotia’s Brian Mackay-Lyons, now see this as a loss, and encourage drawing practice. Bravo! I think of them as akin to a writer’s journal or a performer’s rehearsal. There are passages in them that appear in later works, and there are moments which seem never to appear again.They contain signs of struggle and signs of success…the inner workings of a mind exploring spatial relationships, abstraction, and pure elements of line. For this Red Thread exhibit, I am also including this small section of works in progress. I am alway trying to explore new ideas, approaches, materials, and tools for possible shifts in the direction of my watercolors, prints, collages, and drawings. A wonderful addition to my daily studio work is regular interaction with a special group of women artists: Chris Beneman, Julie Freund, Lindsay Hancock, Anne Ireland, Vanessa Nesvig, Anne Niles, Phoebe Porteous, and Holly Ready. They are serious, spirited, and very talented. We meet together for one full morning to review and comment on each other’s current works in progress. I always come away from our critique sessions with many new ideas and directions to explore. My thanks to each of them for their honesty, varied experience, points of view, and steady support. Thanks as well to current and past members of Peregrine Press for all of the sharing of printmaking techniques, inspiration and fun in both our independent and collective work. Finally, I am beyond grateful for ideas and support from John & Thomas Ryan. Our son, Tom Ryan, is having a first solo show, which will be up 9/11 to 11/11/15! near the corner of Washington and Cumberland Avenues in Portland ME. Look for a profile of my work in the September 2015 issue of Maine Home and Design Magazine, in the CANVAS section, pages 123-129. Written by Jamie THompson, the article highlights three abstract artists: Richard Keen, Kayla Mohammadi, and me. Nov. 22- Dec 21, 2014. Those of you who know this riverfront gallery know it to be a lovely bright space, and Mary Harding is a curator whom I admire. Mary said that she will keep the show up through the winter so that the gallery is bright when visitors stop by Thanks ever for the encouragement! Both works represent forays into using watercolors and pencils in new directions: working directly on panels, and more drawing and collage work. I have tried my hand with pastels, inspired by the colors of Wolf Kahn’s landscapes. I continue to be especially inspired by the work of Romare Bearden, Richard Diebenkorn, journalist Maira Kalman, and Nebraska artist Christina Narwicz. 2014 has been a big year of growth for my work. It was kicked off by the 2013 summer residency week at Hewnoaks Artist Colony at Kezar Lake in Lovell Maine. It was an intense and solo week time of very hard work with no outside obligations nor interruptions. I drew a lot and tried new materials to depict that impressive landscape. There was much gnashing of teeth, and a focus on process not product. The residency experience jump started very productive months in the studio, followed by three Portland exhibitions: a solo show at Art House Framing, the 2014 10 x 10 show, and another solo show in the wonderful Chestnut Street Lofts lobby space. Between the shows and visits to my studio, I sold over thirty paintings, and connected with several new gallery owners. I applied for- and was invited to – another residency week at Hewnoaks in August of this year. As with my 2013 residency stay, it was a productive week of hard work in that beautiful setting. I used pastels and inks and drew the lake and tall white pines each day. I was glad to discover that one can layer pastels by using fixative between layers, but I still find them to be both colorful and very challenging! 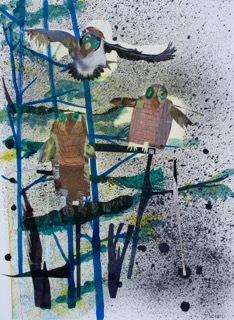 One night I was awoken by three owls, very strong competition for the ubiquitous loons, inspiration for a drawing/collage the next day. Finally, this will be the last blog posting from this wonderful office/studio at 10 Danforth Street. I have had my architecture office and art studio here for almost twenty five years. It has been a wonderful light filled work space, and I have many great memories of colleagues,clients, friends, and families here.I could be happy here for another few decades, but change is good! I have agreed to take on a big new art studio in the nearby Bakery Studios Building at 61 Pleasant Street. The new space has 12 foot ceilings and a concrete floor, room to get messy, work bigger, and explore new materials. The building is home to a fine group of artists, Wolfe Editions, and Peregrine Press. I am trading a finished and carpeted space with heating/cooling and great light for a big raw space! The move out of an office building and into an arts building- likely in early January 2015- will be a tonic and an adventure. It will be a good opportunity to unload some accumulations! and I am confident that – with time – it will be as wonderful a work space as this has been for so many years. It will be great to be just downstairs from the two presses/community of the Peregrine Press! DO KEEP IN TOUCH & COME VISIT ! 61 Pleasant Street in Portland Maine. 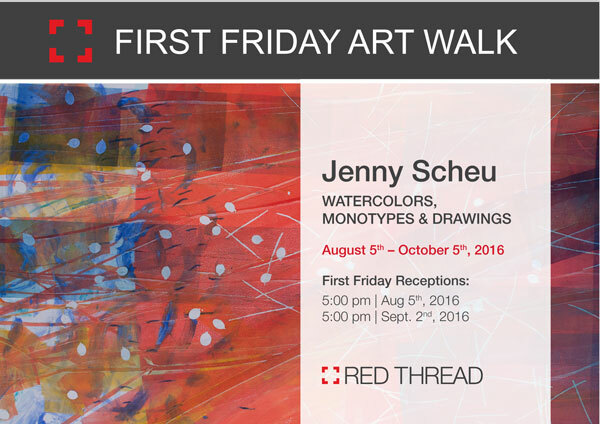 Please note – and spread the word – that the show is already UP/OPEN now in their gallery. It is a small and bright space.. The work looks great. Stop by anytime! The event on 2/26/14 is more of a celebration than an opening! Hope to see you there. 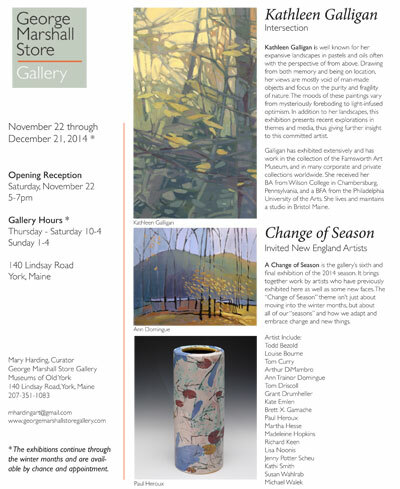 Twenty-three years ago 10 Maine artists created a showcase for 10×10 artwork in Portland. Over time the participants have changed. I am pleased to be included in this year’s group. The artwork presented represents diverse techniques, content and practices. This year, for the first time, we have invited four young artists of the Portland area to participate in this TWO DAY EVENT. All works are $200 (plus tax). Payment is by cash or check.